The Group 1 $1 million Darley Classic is a 1200m sprint feature held on Emirates Stakes Day on the Saturday after Melbourne Cup Day in early November each Melbourne Spring Racing Carnival. The marquee race for short distance stars during the carnival, the weight-for-age feature is one of the headline events on the final day of the four-day Cup Carnival and has held elite level status since 1979. It is known as the race for sponsorship purposes but is also registered as the VRC Sprint Classic. The inaugural winner in 1960 was Karina and since then topline sprinters to win the race include Hareeba (1994), Takeover Target (2004), Miss Andretti (2007) and of course the mighty mare Black Caviar (2010 & 2011). The Darley Classic takes place down the famous Flemington Racecourse ‘Straight Six’ and is the key support act at the meeting that is highlighted by the Group 1 $2 million Emirates Stakes (2000m). The other standout race on the card is the Group 3 Queen Elizabeth Stakes (2600m) offering a bonus to the winner if they had been balloted out of that year’s Melbourne Cup field. The official Darley Classic 2018 Results & Finishing Order for the Flemington sprint classic will be available below once the race takes place on Saturday November 10, 2018. Darley Classic betting markets first open with the early nominations a couple of months out from race day and offer juicy ante-post prices on the possible runners in the sprint classic. Futures Darley Classic odds are always generous but some punters prefer to wait until the field is out before getting behind their favourites. Horses that ran well in their lead-up Group start usually dominate the odds as plenty of recent Darley Classic winners came off a lead-up win including Buffering (2013). Sprinters that ran well in the Group 1 Ladbrokes Manikato Stakes (1200m) at Moonee Valley a fortnight earlier usually sit high up the Darley Classic odds online as the race produced three of the five winners from 2012-16 including Buffering (2013) who did the double. The season’s updated Darley Classic 2018 betting odds and links to our markets on the Flemington Group 1 sprint will be available here once available so stay tuned for the best prices on your Darley Classic tips this spring. Darley Classic tips are led by in-form spring sprinters with previous form down the famous Flemington straight. Previous Group 1 winners and those coming off a good run in the Manikato Stakes in the lead-up also make good Darley Classic betting tips. Other smart tips on the Darley Classic are to look for horses that won their lead-up race, come off a Group 2 Schweppes Stakes run and have drawn an inside alley as just two horses since 2006 have won from a double digit barrier with Mental (10 in 2012) and Malaguerra (11 in 2016). Our Ladbrokes’ insider Darley Classic 2018 betting tips and Flemington racing selections will be detailed below the week of the race so stay tuned for the short-distance specialists to back and sack this spring. #3 Santa Ana Lane: Anthony Freedman’s six-year old has drawn barrier five ahead of Saturday’s race, and will be hoping to improve on what was a disappointing run in The Everest last start. The heavy surface didn’t help matters, but Santa Ana Lane has showed time and time again that she’s every threat on a good track. After winning The Stradbroke Handicap at Doomben, she went on to win the Group 2 Premiere Stakes back in September, beating home a strong field that included Redzel. #1 Redzel: It’s difficult to imagine Redzel failing to place in this race after such a huge triumph in The Everest at Randwick a month ago. It’s no surprise to see Melbourne Cup winning jockey Kerrin McEvoy on board, while the barrier draw was also kind to the Snowden’s six-year old. Redzel trialed beautifully over 850m last week, and her 4-3 first-up record is just as encouraging. #7 Kementari: Godolphin have been on a roll in the last six weeks, but they’ll be hoping for a little more out of their four-year old in the Sprint. Kementari kicked off her prep with a disappointing third in the Manikato Stakes at Moonee Valley three weeks ago, adding to his long list of placings dating back to August. Drawing barrier 9 isn’t the end of the world, but it will take some luck down the straight if he is to beat the likes of Redzel and Santa Ana Lane home. 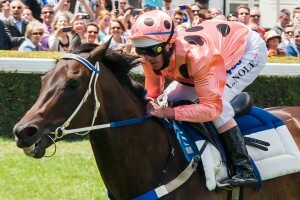 Black Caviar (2010-11) is one of the most notable past Darley Classic winners. Photo Credit: Race Horse Photos Australia. The Darley Classic field has attracted big numbers plenty of recent editions of the Group spring showdown, but Black Caviar scared off her rivals in 2010 and 2011 defeating just six other contenders for her back-to-back victories. The Darley Classic field is made of the season’s best sprinters and traditionally features Manikato Stakes graduates, with the last to complete the Manikato – Darley Classic double being Buffering (2013). Final Darley Classic acceptances close the Wednesday before the race while the early nominations close in September and usually feature over 50 entries. The official Darley Classic 2018 Final Field & Barriers are set for release on November 8, 2017 at 9:30am (local time) and will be published below once out so bookmark this page to view the top sprinters set to do battle in the Flemington feature. The Darley Classic Nominations for 2018 close in late September and the full list of early Darley Classic entries will be available below once released by Racing Victoria. The 2018 Darley Classic Nominations attracted 59 sprinters in the mix including last year’s winner Redzel, Group 1 Sir Rupert Clarke Stakes winner Jungle Cat and the grey flash, Chautauqua. The Darley Classic form guide has all the basic information you need to know before placing your bets on the classic like the starting positions of all the runners, their jockeys and trainers. A good form guide on the Darley Classic also shows the lead-up form of the hopefuls, their win / place percentages and track / distance records so you can sort through who to back and who to sack on race day. When doing the form on the Darley Classic race it is key to look for graduates out of the Manikato Stakes, proven Flemington performers and sprinters with previous Group 1 wins on their record. A link to the comprehensive Darley Classic 2018 Form Guide on all Darley Classic Horses will be available below the week of the race. The Darley Classic results show the exact finishing order of all the starters plus any horses scratched from the original field. Along with the Darley Classic winner, winning time and margin you can also see the starting price of all the horses once the results are out when the event runs as Flemington Race 5 on Emirates Stakes Day. There have been plenty of upset Darley Classic results in recent years including Delectation ($13 in 2015) and Buffering ($11 in 2013). Notable recent Darley Classic winners include Redzel (2017), Terravista (2014) who also ran second in the 2017 edition three years later, Black Caviar (2010-11), Miss Andretti (2007) and Dance Hero (2006).